A significant improvement in efficiency came with the first machine chop (Barker 1997b), bearing the inscription DAI NIPPON 2602 PENANG in Romaji (Latin) script, supplementing Penang's Okugawa and Uchibori seals from April 1942 (Coulter 1965, Dewey 1965b). DAI NIPPON means 'Great Japan'. 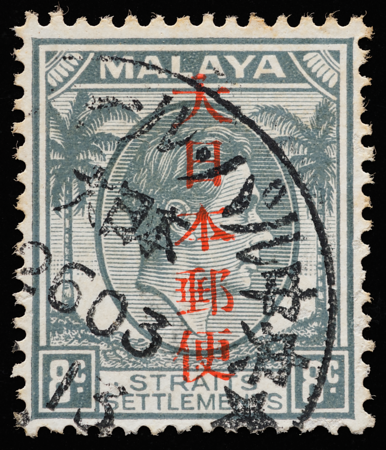 Stamps were overprinted at a Chinese printing press at Chulia Street in Penang. As the sheets of 100 were overprinted in blocks of 5 by 5, double overprints were occasionally produced when the block was not shifted correctly (Cheah 1976b, 1978). There occurred various defects in the lettering of the overprint in different positions on the sheet, including missing and distorted characters (Cheah 1982b). Astonishingly, the overprint exhibits three different fonts, one on each line; presumably the Chinese print shop offered limited replicates of moveable type of any single Latin font. The first two lines are in the 19th-century antique poster style with stout triangular serifs, the line with the numerals being of a heavier weight and, curiously, slightly off centre to the left. The 'A' has a distinctive double-horned serif on its apex, lacking in the 'A' on the third line. Note also the defective 'N' with a broken diagonal. The curious font on the third line has the pronounced stroke contrast of the 18th-century didone style, finished with unusual tapering serifs and a graceful flare in the 'G' somewhat akin to a Wagner tuba. The first 'N' suffers from a bent stem. In total, there are six different fonts on this stamp, representing humanist, grotesque, fraktur-script (ref to earlier discussion), didone and antique styles. In fact, there is a seventh font hidden in the stamp—the watermark in script style. 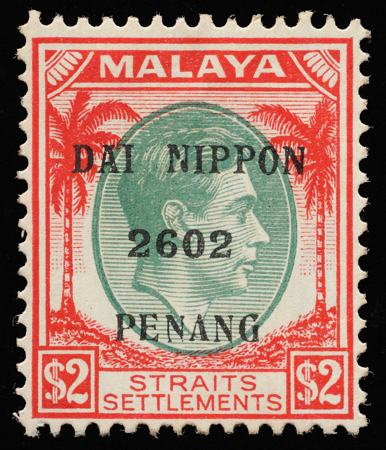 Gallatly (1962b) was of the opinion that Penang was a "nest of philatelists" who ran a "horrid industry in creating artificial covers…which grew to become as epidemic as measles". 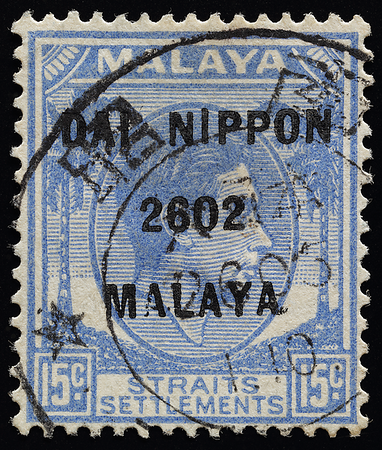 The Syonan Shimbun reported that in the first week of the occupation, 15,000 items were posted in Penang, mostly by philatelists. 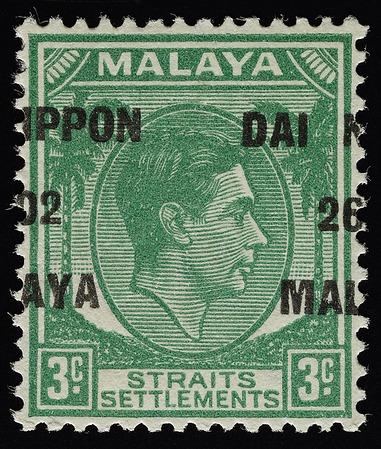 The PENANG overprint was succeeded by the much more typographically consistent DAI NIPPON 2602 MALAYA overprint around June 1942 (Carpenter 1990). It was applied by machine on the entire sheet of 100 at once in sans-serif instead of the serif type of its Penang predecessor. 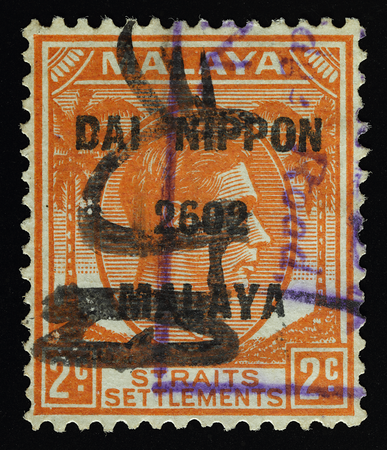 The stamp on the left has an inverted overprint with a chipped and bent 'N' and a slightly raised last 'A' of MALAYA. At least one fake is known, with thicker letters (Tsuchiya 1999). A typographically inaccurate forged overprint with a crooked baseline and overspaced letters comes complete with a fake postmark. At least two other forgeries exist. Hit and miss: overprinting the coconut trees instead of the king. 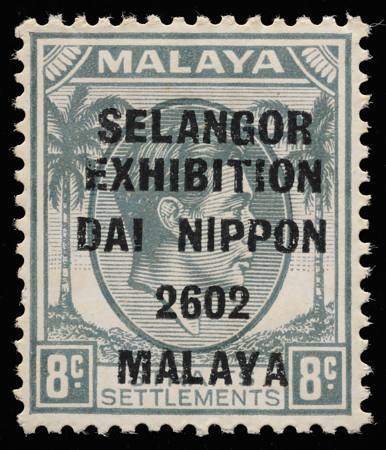 A related overprint, SELANGOR EXHIBITION DAI NIPPON 2602 MALAYA, was released on 3 November 1942 in conjunction with the First Selangor Agri-Horticultural Exhibition in Kuala Lumpur. It was a limited edition available only in Selangor for the two days of the exhibition. 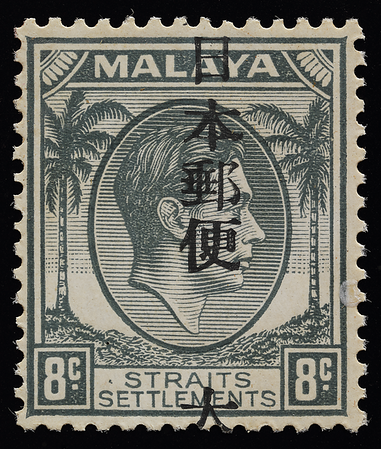 Inverted overprints of these were reported to be especially valuable after the war (Singapore Free Press, 28 October 1946). Following a decree to eliminate the use of English, the machine-printed Kanji Overprint was introduced in December 1942 and used until the end of the war. The characters translate to 'Great Japan Postal Service' and are in songti, a printed serifed form one would associate with a book, like Garamond or Caslon. The 8c grey was the most commonly used denomination before and during the war, being the basic letter rate (Carpenter 1990). 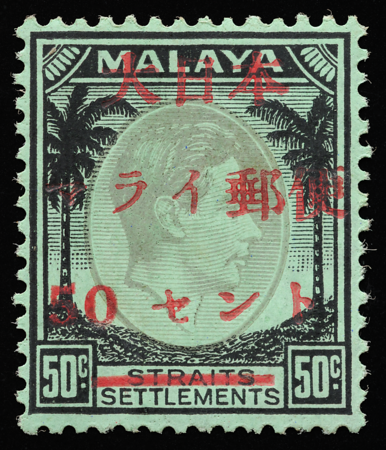 The steel datestamp (left), from the post office of Bandar Bahru (inscribed in Katakana characters; see Proud & Rowell (1992) for translation keys) in Kedah and fading away to the left like a gibbous moon, was introduced in the later part of the occupation; pre-war postmarks had been used initially. There were interesting aberrations in the overprint (Coulter 1964) despite it being a machine chop, including unusually small second characters appearing in some positions in the third setting that were amended in the fourth. Here a normal character (coloured red) has been digitally translocated from the neighbouring stamp for comparison. The Kanji-overprinted 40 cents was reportedly used in Thailand and Burma. It was issued at Malayan post offices set up along the infamous Death Railway to serve the labourers (Proud & Rowell 1992). The northernmost post office was thought to be in Aparon in Burma (Tett 2005). The localized use of stamps in foreign territories with foreign cancellations happened in both peacetime and wartime. Maselis (2018) documents Belgian and African examples. 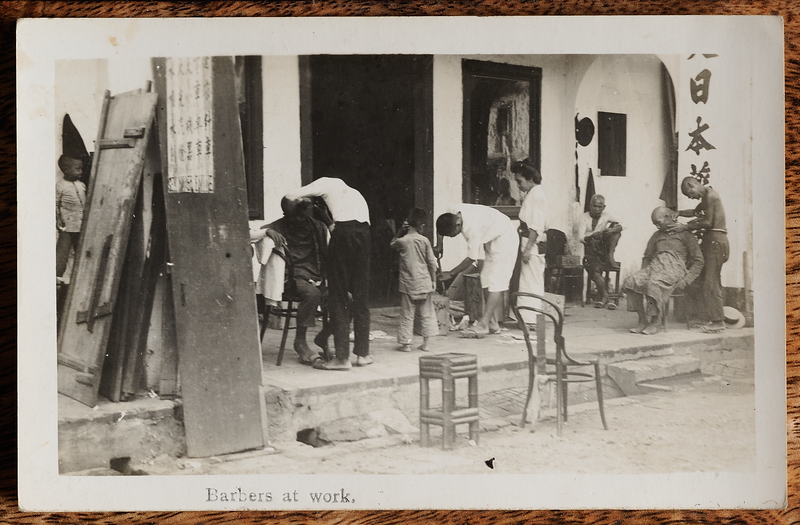 Tanned and hardworking coolies getting haircuts outside what appears to be the shop of a Japanese merchant with the words 大日本 ('great Japan') on the pillar and the presence of a kimono-clad lady with bunned-up hair. A selection of chairs and stools of the period can be seen. Published by The Federal Rubber Stamp Company. The photographic paper for this silver bromide print was manufactured by Thomas Illingworth & Company in London sometime between 1919 and 1930. 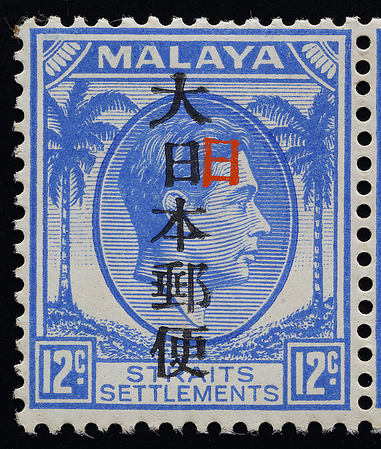 On 16 December 1944 only, coconut definitives with machine-overprinted Red Cross surcharges in a mixture of Kanji and Katakana characters were produced and sold in Singapore. These stamps were meant for censored letters enquiring about personal or family matters addressed to prisoners of war in other countries, which were to be delivered via the International Red Cross in Geneva. The central post office in Kuala Lumpur subsequently withdrew the stamps, opting instead to use the more clearly overprinted stamps of Selangor. See Rowell (1961) and Proud & Rowell (1992) for details, and Hale (2016b) for typesetting variations. 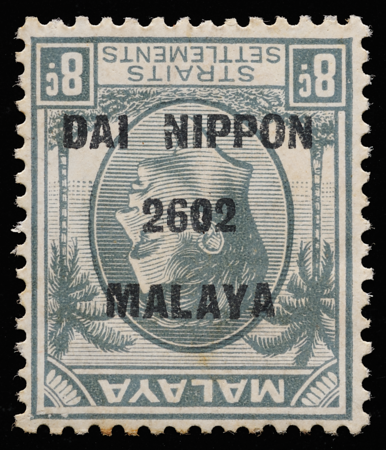 Very few of the surcharged coconut definitives were used; it is suspected that the real purpose of the stamps was for a Japanese fundraising drive, especially since most of the overprinted denominations were high values (Carpenter 1990). It was rumoured that the withdrawn stamps were given to shipping companies for fiscal use (Harral 1961b).